Three years ago, the Make-A-Wish foundation, an organization that grants wishes for terminally ill children, came to our home to ask our then 15 year-old son who has Duchenne muscular dystrophy, what his most special wish was. It was just after the exciting campaign and election of President Barack Obama. My son’s wish was to meet the newly elected president in the White House. We were told that it may take a few years, and they suggested that if he didn’t want to wait that long, he could request a different wish at any time. My son said that he would rather wait for the wish to come true. Now, three years later, out of the blue I got a call advising me that my son’s (now age 18) wish had come through. I was told that in two weeks my family and I were to be flown to Washington DC, to the White House, to meet the President! There was much confidentiality surrounding the visit, and although I was permitted to share the news with close friends and family, I was asked not to put anything out publicly on social networks such as Facebook. I immediately called my parents in Malaysia to tell them the exciting news. They were thrilled with the fact that their grandson had an appointment with the President. The news spread, and before we knew it friends and family from all over the world were sharing our excitement. The timing was perfect. My son’s health was stable. After selecting gifts and items we wanted signed by the president, there were many emails back and forth requesting personal information about my son for the president to know such as his interests and hobbies. We put the information together in a personal email for the president to read. The days went by quickly, and before we knew it we were en route to Washington DC. Once there we were told that the very next day we were expected at the White House. I reminded my children to be present and mindful of everything that was to happen that day, and they also reminded me. Throughout the hustle and bustle of getting organized and ready, my mind was calm and open. On the day of the visit, as we drove along the streets of Washington DC, I caught glimpses of the Capitol and the Washington Monument through the trees and the sparkling sunlight as I looked out through the window of our vehicle. I thought of the many notable people who had shared this route on their way to the White House. We arrived at the East Wing entrance. Security was tight but they were expecting us, and the gates opened swiftly as our convoy was waved on through. I watched my son drive his wheelchair out of the disabled van, with his contagious smile and lively blue eyes reflecting a clear blue sky. He looked stylish with his casual blond hair, his carefully selected new pressed shirt and dark blue pants, blue tie and new black shoes. He was so vibrant and I was in awe of him. The secret service was there to greet us, and escorted us through the East Wing entrance of the White House. Our private tour took us though grand rooms and corridors so full of history. Every now and again we saw the view outside from within, a view few people see. Formal portraits of past presidents and first ladies flanked the corridors, methodically placed amongst the casual family photographs of the past first families. Pondering over some of the portraits I recalled the events of that time. As I started remembering historical facts, my son reminded me to be present. The carefree mood of the East Wing, where we met Bo the President’s dog and ventured out into the beautifully manicured Jacqueline Kennedy Garden, where my son rode in the president’s private elevator and then relaxed in the President’s private movie theatre, suddenly changed as we approached the West Wing. The secret service started to appear and I knew then that the moment had come. The moment we had all been waiting for. We waited for a few minutes before we were escorted along the West Wing corridor past the Rose Garden. Here we entered through the West Wing doors and were asked to leave our cameras and cell phones on a table. We were advised to wait a few minutes for the president to wrap up a meeting. Within the next few minutes it was quite a surprise to see Hilary Clinton appear from a side door. As we greeted her, it was then that I realized we were going to meet the president in the Oval office. It was our turn next. At that moment I felt the adrenaline kick in and I was trembling both with excitement and nervousness. Suddenly, through a corridor before us, a double door opened releasing the mid afternoon sunlight of the Oval Office. A tall man stood before us with the light streaming behind him. It was the President. President Obama walked towards us in his relaxed fashion. He reached out and placed his hand gently on my son’s hand, the other on his shoulder. 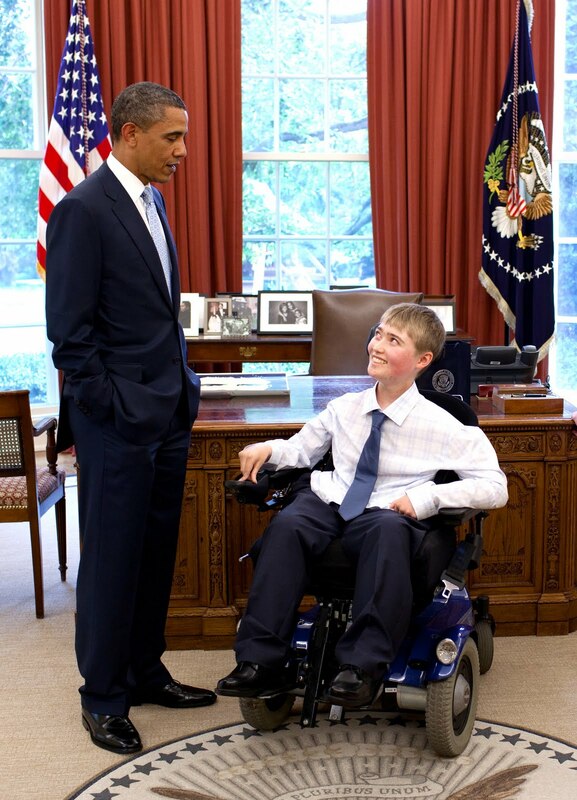 The President humbly thanked my son for coming to visit. The President showed us into the Oval Office and closed the door. For the next 20 minutes we had a dynamic conversation ranging from his interest and concern for the seriousness of my son’s condition, to the outbursts of laughter when he attempted to play the sompotom, a small traditional musical instrument we brought him from Borneo. When he asked us what we had planned for the summer, my son proudly told him about our Expedition Mt Kinabalu climb to raise global awareness for Duchenne. The President jokingly said he would love to come and that he wanted to hear all about it. He shared with us his passion for traveling to exotic places. He was interested in my cultural heritage as he broused through a book we gave him about Borneo. He asked how my parents had met as he stopped to look closely at an image of Mt Kinabalu. He had questions for all of us, as we did for him, and with great care and deliberation, he always brought it back to being about my son. The President was genuine, warm, friendly and compassionate. It was an incredible experience to be in the presence of an individual who has inspired not just my son and me, but also the world. As I took in the moment, I noticed the few selected pictures on the wall of the Oval office, the grandfather clock in the corner, the secret door that had been painted to look like part of the wall, the old style telephones on the desk and the carved eagle on the ceiling. I smiled as I glanced at the assortment of happy family pictures on a small table in front of the window. So much history had happened within these walls. As the chief white house photographer continued clicking away, I realized that we too were part of its history. I thought of the many influential world leaders who had met here, the discussions and the decisions that impacted the world. I looked over at the President deeply engaged in a conversation with my son. It was a moment I will always remember. 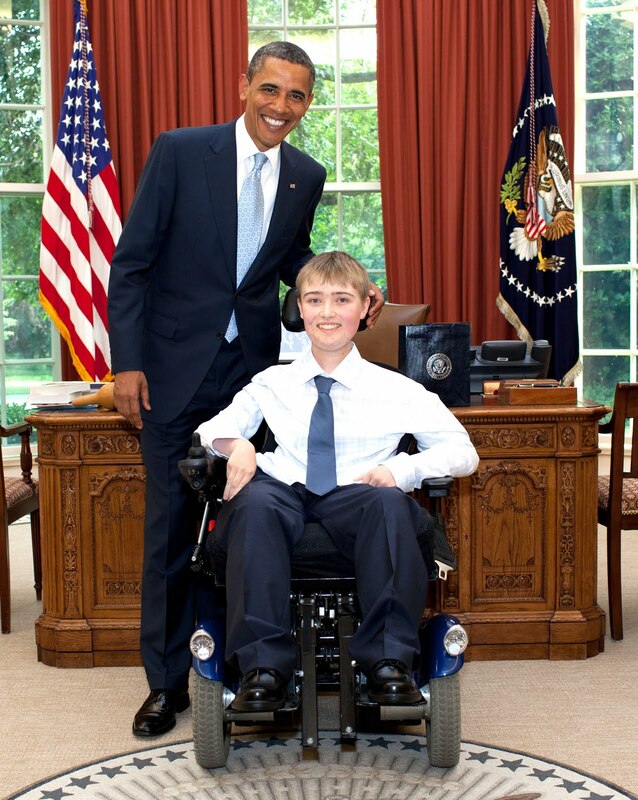 I was able to personally thank the President for being a voice of hope and inspiration to me. As we said our goodbyes, the President commended my son on his hard work, and wished us the very best of luck for the climb. He showered my three children with gifts. For my son, it wasn’t the White House M&M’s, or the specially designed box of caramels or the signed engraved coins that he wanted to hold onto, but it was a miniature copy of the US Constitution that at the last minute, the President took from a different drawer, signed and placed in his hand. After a long goodbye, we walked out of the Oval Office. I glanced behind and smiled once more at the President. He winked back. 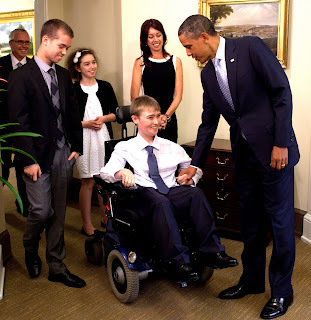 I know that this September 9th, as I climb Mt Kinabalu for my son and for all those with Duchenne, I will reflect on my visit, and on some of the words from the President’s past speeches. The fact is we are all one people, we can repair this world, and there is nothing false about hope. Although the battle ahead may be long…Yes We Can! Please check out my May blog about Preparing to Meet The President. wonderful, Cath! Thank you for sharing this experience! Beautiful! I’m in tears. Absolutely wonderful. Dusty is beaming in his photo with the President, as is the President. Talk about awareness!!! Fantastic! Thank you so much for fulfilling your son’s wish and for furthering all of our sons’ cause to raise awareness about DMD. I look forward to the day when it is Dusty sitting behind that big desk in the Oval Office and my son rolling in for a chat about policy and our continuing fundraising efforts and adventures. Wow, must have been an awesome experience for Dusty and the family! Wonderful! I bet he was so happy to get his wish! Hi Cath, I am Gergo, from Hungary, father of Misko (http://www.facebook.com/MiskoFoundation). Though we did not meet, we are absolutely proud of you, organizing everything that we can read about. Meeting the President must have been a great experience to Dusty, so will be the expedition. What an amazing experience!! Best of luck with everything Dusty!! That Was The Year That Was!